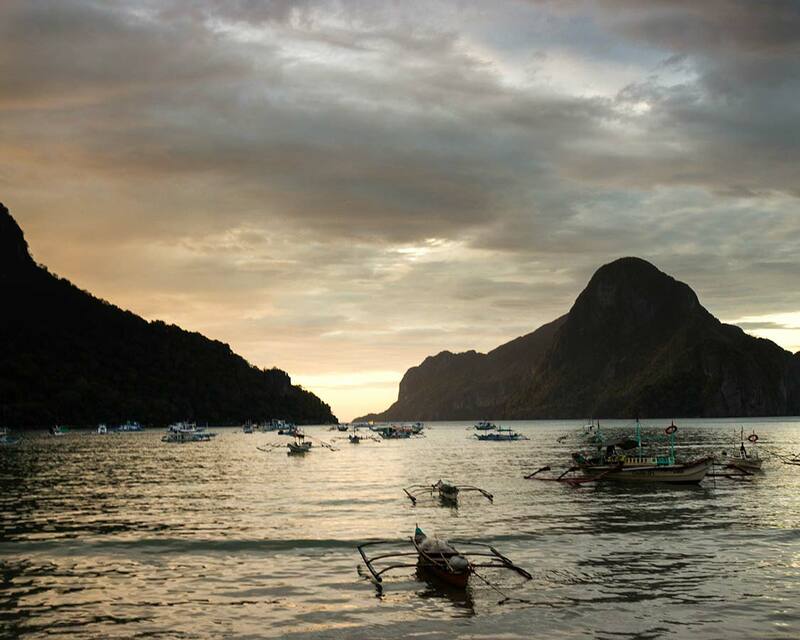 For those planning a trip to the Philippines, it is almost a crime to avoid the popular destination of El Nido. This small town in the Palawan region is the quintessential Philippine paradise. And with over 45 islands it has gained worldwide attention for its beauty. And with loads of caves, lagoons, and undersea life, it’s hard not to find amazing things to do in El Nido Palawan. El Nido is one of the top tourism destinations in the Philippines, and one of the best places to visit in Palawan. It’s famous for its postcard-perfect karst rock islands, white sand beaches, gorgeous lagoons, and laid-back lifestyle. You can get to El Nido from Manila through El Nido Airport via a direct flight. Currently, the only airline offering flights directly into El Nido is Air Swift (You can find their information here). 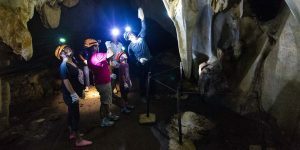 However, people searching for what to do in Palawan often combine a visit to other great Palawan attractions such as the Underground River in Puerto Princesa. For those traveling to El Nido from Puerto Princesa City, you can make the drive or catch a shuttle van or bus from Puerto Princesa town. The distance from Puerto Princesa to El Nido is about 200 km (137 miles) and takes about 6 hours. The core of El Nido town is small and easy to navigate on foot. Those staying within the core of the town can easily get to most places via a short walk. 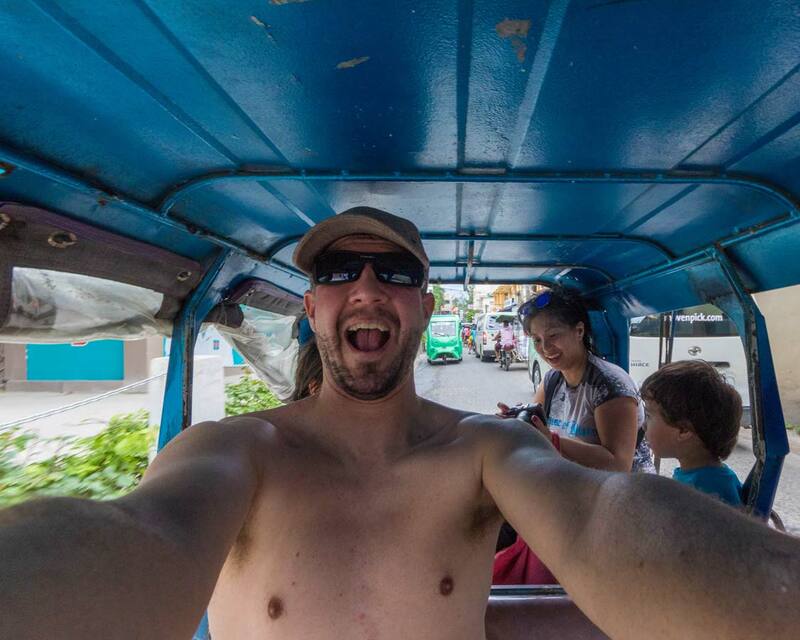 For those staying outside the town, tuk-tuks are usually the most cost-effective travel style. Or you could rent scooters as well. As with most towns in the Philippines, there are minimal traffic rules, no sidewalks, and a lot of distracted drivers. If you are walking through El Nido with kids, keep them close and near the side of the road. The main tourist area near Altrove Restaurant is closed to traffic in the evenings though, and it makes a great place for an evening stroll. Is Family Travel to El Nido Safe? 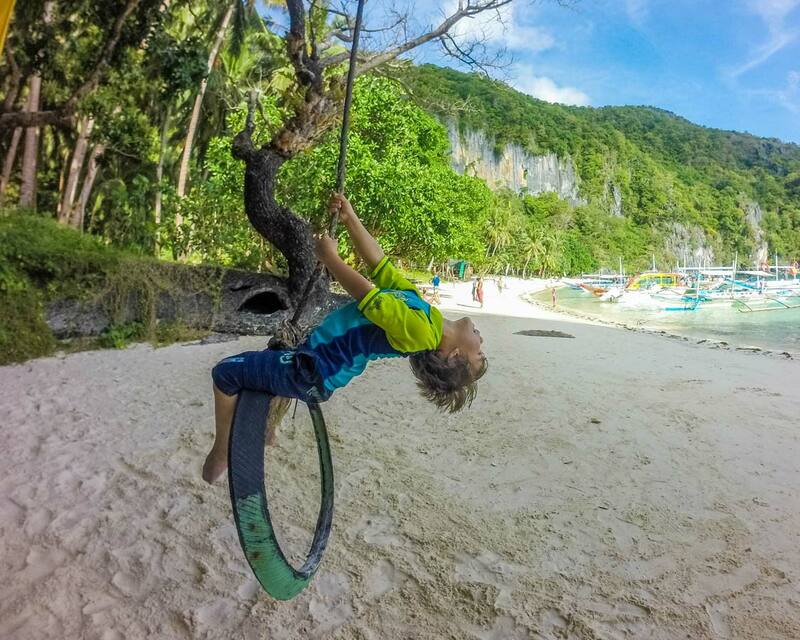 El Nido offers one of the most spectacular natural playgrounds for kids. 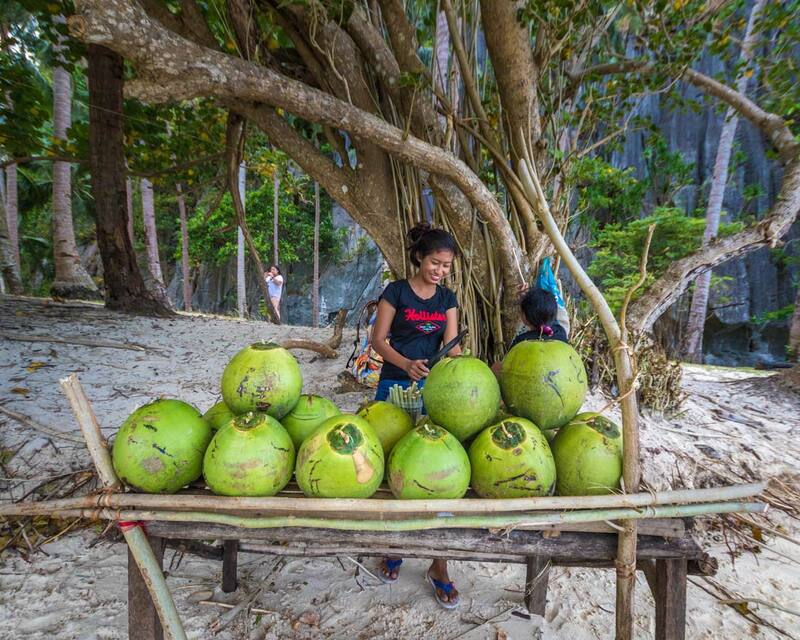 Touring the islands of El Nido with children is an absolute treat, and you will find few places more welcoming to children than Filipinos. 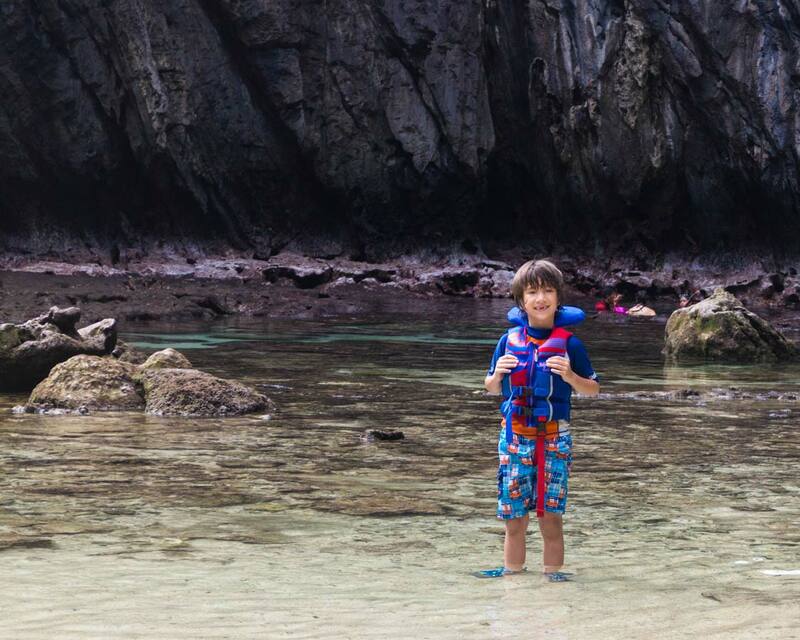 It’s important to remember that most El Nido island hopping tours won’t include life jackets suitable for children. 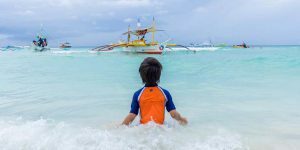 Similar to our experience looking for great activities in Boracay, we were approached by numerous parents offering to buy our children’s life jackets, as they couldn’t find any of their own. I highly recommend that you purchase one before you travel to the Philippines. We recommend Hyperlite children’s life jackets. You can find the prices for them here. El Nido, Philippines is small. But it can get very busy, especially during the high season. It’s highly recommended that you book your accommodations in El Nido ahead of time. Even restaurant reservations are recommended if you can find a restaurant that accepts them. Contrary to popular belief, there are ATM and debit machines in El Nido. However, there are very few of them, and they can run out of money, especially later in the day. Although many restaurants accept credit card, power interruptions are common in the town. So, we recommendd you have cash on hand when you visit El Nido. If you haven’t bought one yet, purchase a dry bag from one of the local sellers. Don’t risk your electronics. Although internet service in El Nido is among some of the best in the Philippines, it can still be sketchy. Expect slow and often interrupted service. There are four main El Nido Tour Packages available from nearly all tour operators. They are boringly named, Tour A, B, C, and D. You can learn more about the tours below. 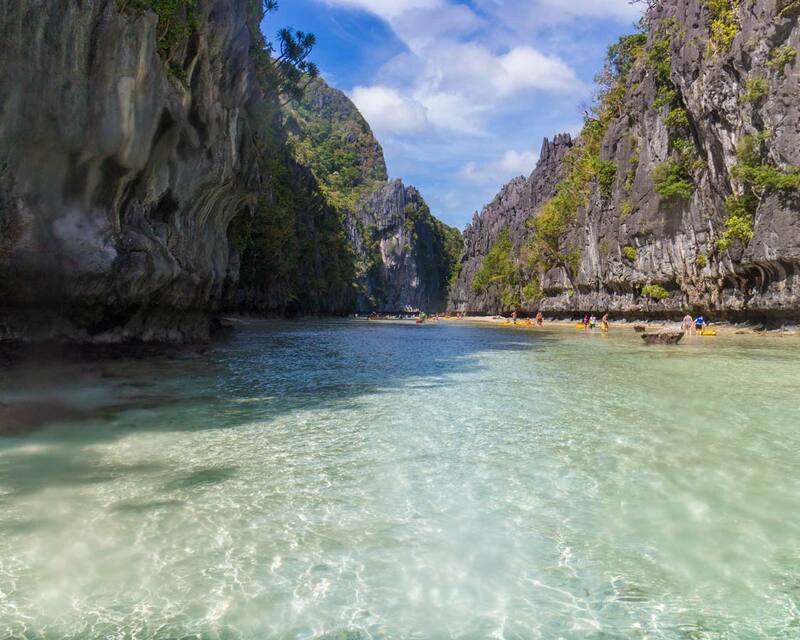 The Small Lagoon is one of the most iconic spots in El Nido, this narrow canyon is loaded with beautiful nooks and crannies to explore, and kids will love the shallow areas that are perfect for spotting colorful fish. The Small Lagoon is part of El Nido Tour Package A. 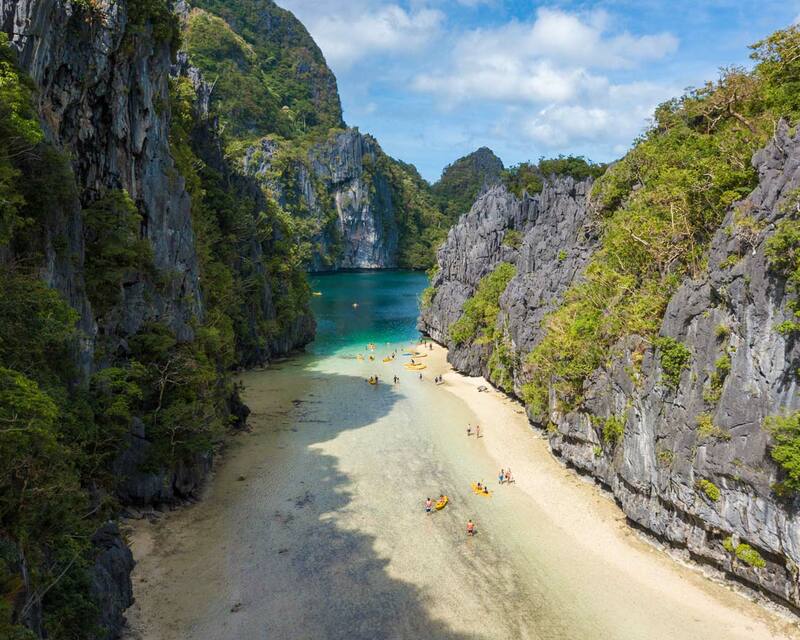 The Big Lagoon is one of the most iconic destinations in El Nido. This long canyon-like stretch of shallow water gives way to a deep, turquoise lagoon filled with coral and colorful sea life. 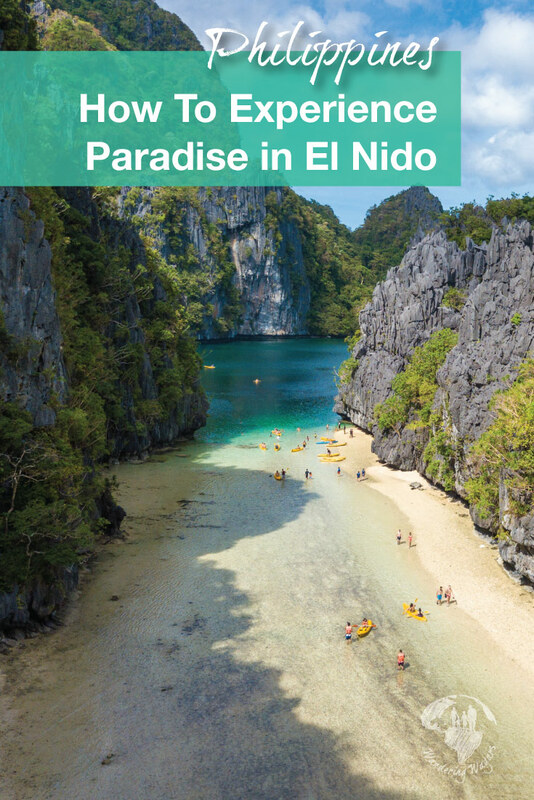 The Big Lagoon is packaged under El Nido Tour A. 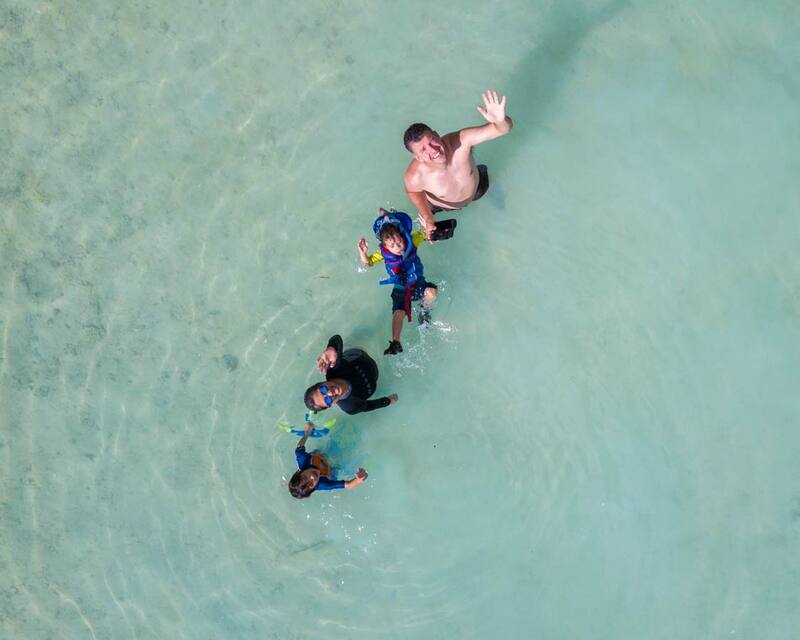 The Big Lagoon is incredible, and it’s great for kids since the shallow waters allow a comfortable and refreshing stroll, that’s why we rated it one of the top things to do in El Nido Palawan. The Secret Lagoon is a small rocky lagoon accessed via a small hole in the side of a cliff. It has become famous through some viral videos. Inside the Secret Lagoon is a shallow, rocky area great for exploring tidal pools and a small beach. The Secret Lagoon is part of El Nido Tour Package A.
Shimizu Island was one of our favorite lunch destinations in El Nido. The rock formations jutting into the bay are gorgeous, and the two connected beaches offer vastly different views and experiences. There is a picnic shelter and a small manual flush toilet on the island as well, which is great if you’re visiting El Nido with kids. Shimizu Island is offered on El Nido Tour Package A.
Entalula Beach is a beautiful stretch of sand shaded by towering mountains. Strung from a tree on the left side of the island is a perfectly placed swing that makes for a great photo opportunity. Kids will love seeing how high they can get before jumping off into the soft sand. Entalula Beach is included in El Nido Tour Package B. Snake Island El Nido is one of the most famous sites in El Nido. This tiny island has a sandbar that stretches and curves towards its neighbor. There is a small island bar about halfway down the sandbar that is accessible during low tide. 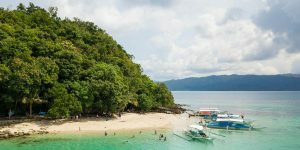 Snake Island is part of El Nido Tour Package B.
Pinagbuytan Island is a tall mountain island with an absolutely beautiful palm tree forest and tall grass field on one side. There are the usual gorgeous El Nido rock formations, but it was one of the most peaceful islands of our entire visit. A visit to Pinagbuytan island is part of El Nido Tour Package B. If you watch the video at the bottom of the article, all the opening scenes were shot on Pinagbuyutan Island. You’ll see just how beautiful it is. On the left side of Ipil Beach is a small opening in the cliff that opens up to a spectacular cave with tall ceilings. 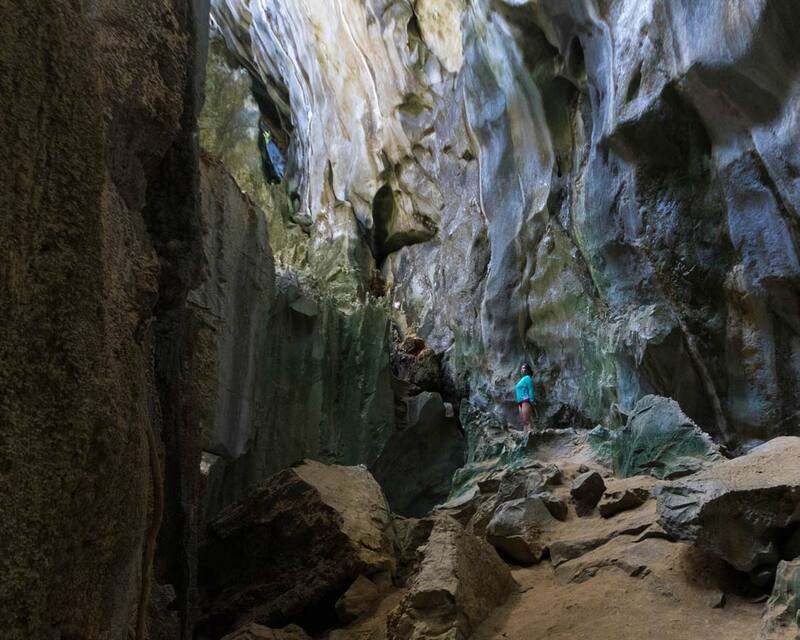 This cave on Ipil Beach in El Nido once held artifacts from the indigenous people. 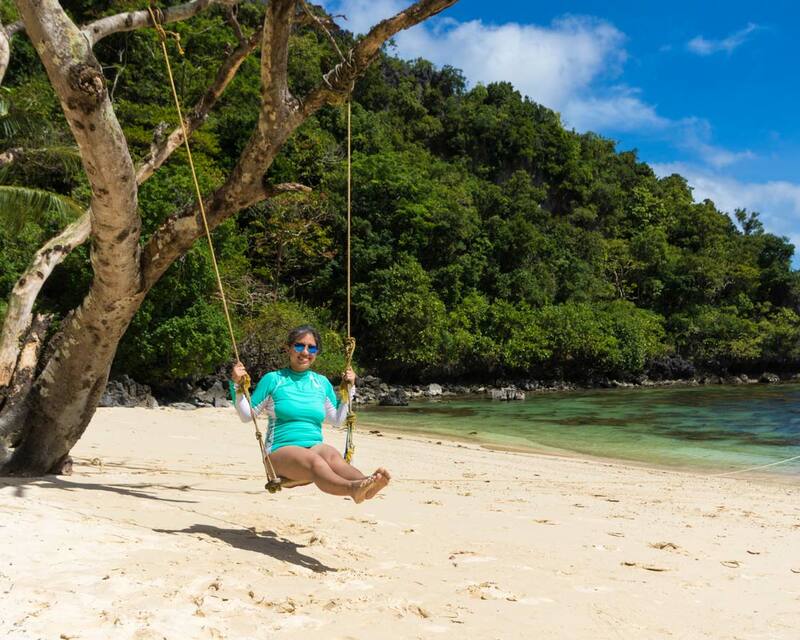 Ipil Beach also has a great tree swing. It is offered on El Nido Tour Package D.
Cadlao Lagoon is an open lagoon with one half shallow water and one half deeper water. The lagoon is divided by a small rock island in the middle. 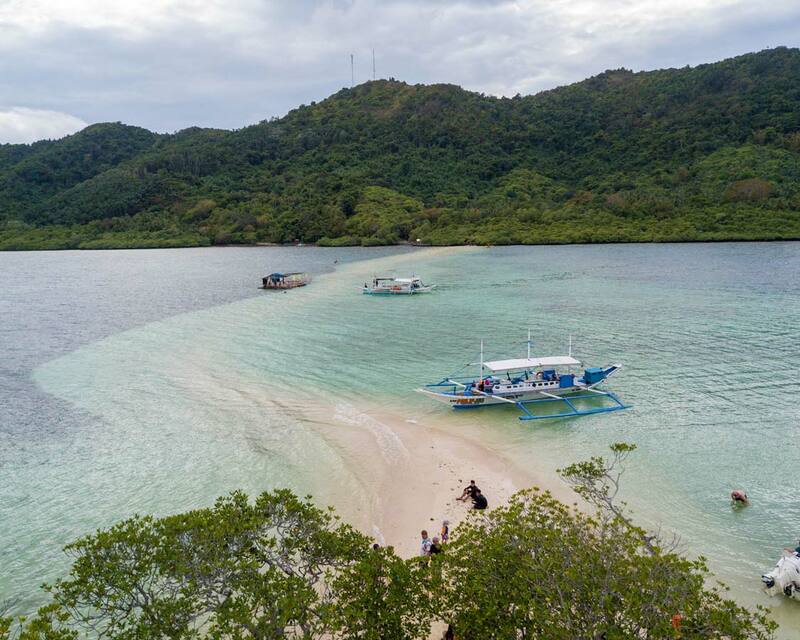 Cadlao Lagoon is a popular spot to search for colorful starfish, or just swim around in the beautiful waters. Cadlao Lagoon is part of El Nido Tour Package D.
Traveling to El Nido with Kids is amazing! 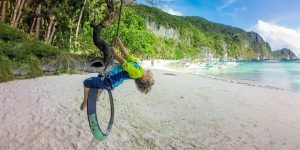 Many of the El Nido island hopping destinations have great features that are perfect for kids, and of course photo opportunities! One great example of this is the tire swings at Pasandigan Beach. 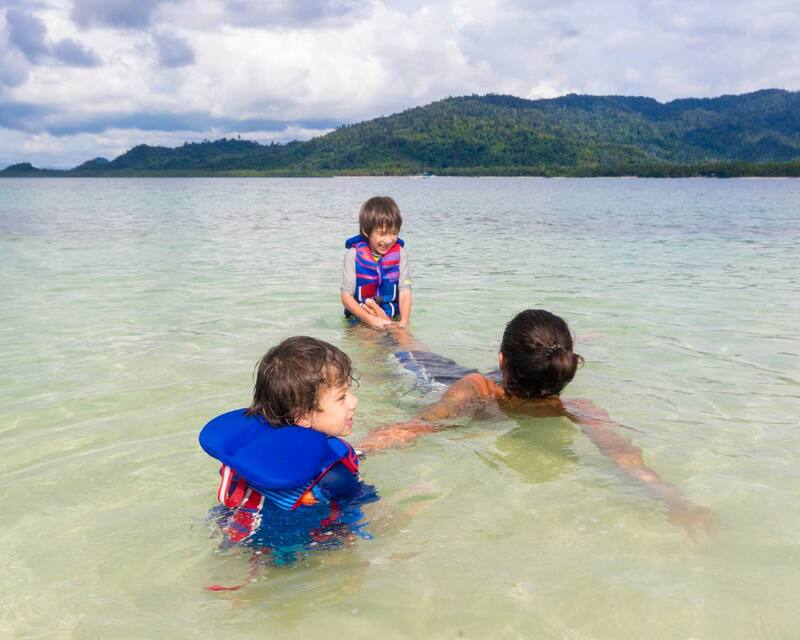 Pasandigan Beach also has wonderful shallow waters for young snorkelers. El Nido Tour D includes a visit to Pasandigan Beach. A visit to Pasandigan Beach, with its relaxed atmosphere and playful mood, is one of the best things to do in El Nido Palawan. 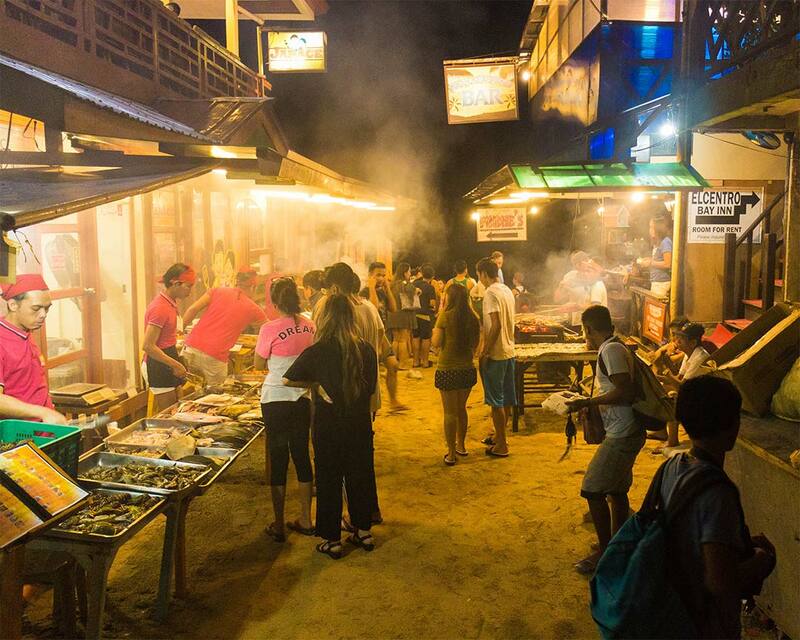 The nightlife in El Nido starts early, and one of the busiest places to join the action is at the El Nido Fish Market. This small area bordered by Jarace Grill and Sea Jane Resto Bar sits where Rizal St. meets El Nido Beach. Visitors can buy seafood directly, or have them grilled on-the-spot and served at the restaurant. Jarace Grill is one of the most popular restaurants in El Nido. Seats fill up fast. It is best to be prepared. 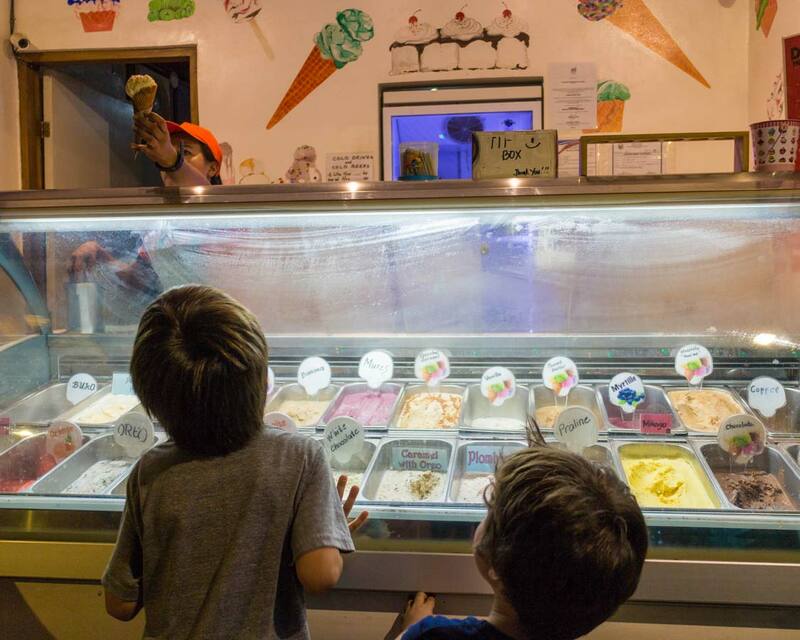 Nothing closes out a day of adventure travel like a delicious homemade Ice Cream. And D’Factory on TayTay on the main drag dishes out an amazing selection of flavors including traditional local favorites such as Ube. 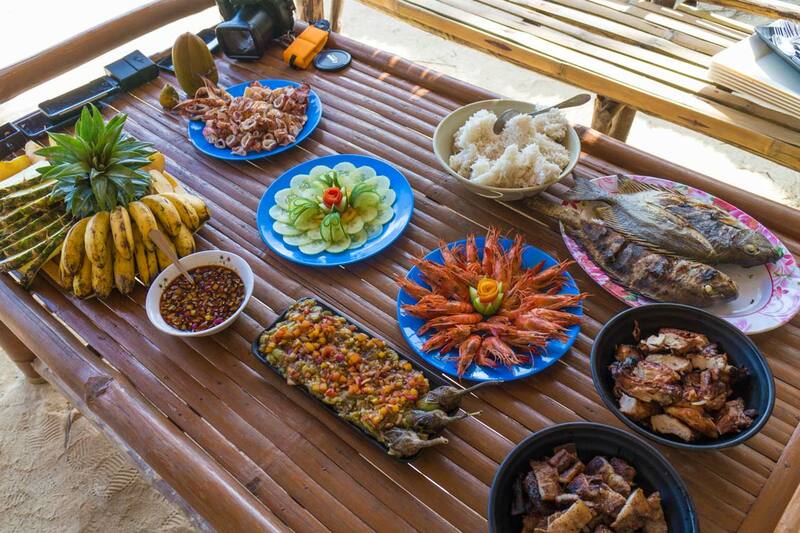 The only thing better than relaxing on a secluded island paradise than eating delicious fresh Philippine seafood and delicacies on a secluded island paradise. Often, the tour packages include these delicious lunches. However, you can also organize them as a separate outing. It’s hard not to notice Altrove Grill when walking through the main drag in El Nido. There is always a line outside of Altrove, and there’s a good reason why. Altrove offers a super laid-back bohemian atmosphere. Service is first-come-first-serve, but if you manage to get one of the floor seats at the back, it’s one of the most relaxing places to eat in El Nido. 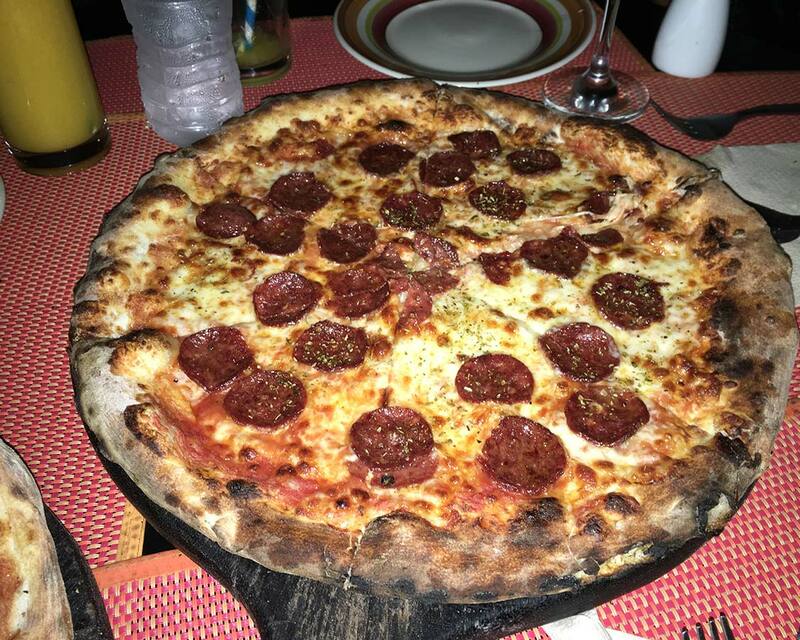 Once you dig into the soft crust, you’ll understand why a visit to Altrove is one of the most popular things to do in El Nido Palawan. There are countless tour operators in El Nido and it is very easy to book outings on short notice within the town. Most El Nido accommodations can also arrange Palawan tours quickly. For our outings, we used Skipper Charters. Their El Nido tour team was amazing with our children, and there were some wet eyes when we finally had to say goodbye to them. You can contact Skipper Charters here. El Nido tourism is booming, and there are some great hotels in El Nido that will suit all travel styles. For those looking to stay directly in El Nido or near El Nido Beach, it’s good to know that things there can be loud in the evenings. 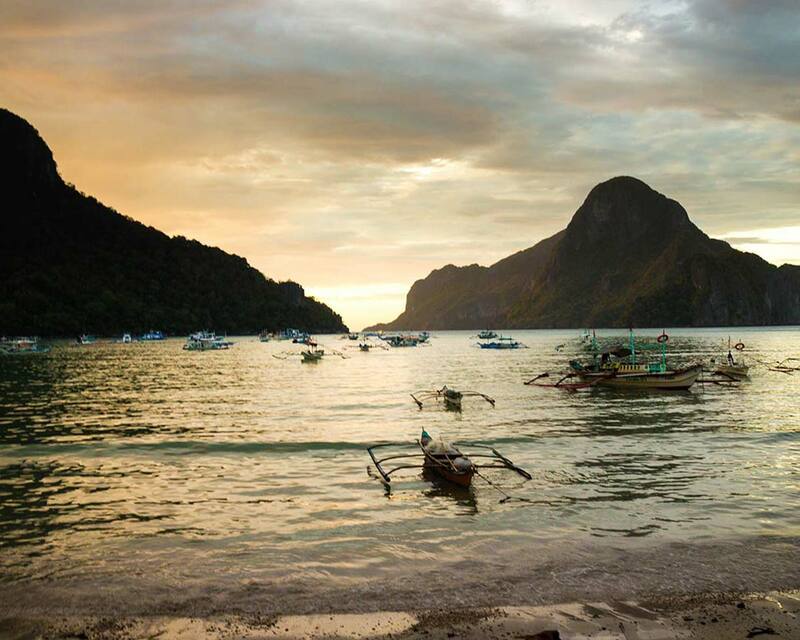 El Nido Beach also can have a bit of an … aroma to it that some visitors might find off-putting. The Nest El Nido Beach Resort is located just 1-minute from the beach and has all the views and amenities for those looking for one of the best resorts in Palawan. The resort offers continental breakfast and excellent amenities that are great for families. The Nest is one of the most popular El Nido Palawan resorts, so it’s good to book early. You can find the best prices and availability on booking.com here or Hotels Combined here. Located just 4-minutes from El Nido Beach is Amakan – Bed, Bunk, Breakfast. The location of Amakan is fantastic offering an intimate atmosphere. There is also a great on-site restaurant for those not looking to walk after a long day exploring the islands of El Nido. You can find the best prices and availability on this El Nido accommodation on booking.com here or Hotels Combined here. For those willing to stay a little outside the city of El Nido, Garden Bay Beach Resort El Nido is one of the best options. The resort offers either sea-view or garden view rooms, and both views are wonderful. They even offer two bedroom bungalows for the perfect family accommodations in El Nido. You can find the best prices and availability on booking.com here or Hotels Combined here. 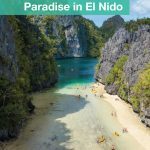 Is El Nido Palawan a Great Destination for Family Travel? There is a very good reason why El Nido is one of the most popular destinations in the Philippines. It’s easy to navigate, exciting, and offers some of the most unforgettable views in the world. 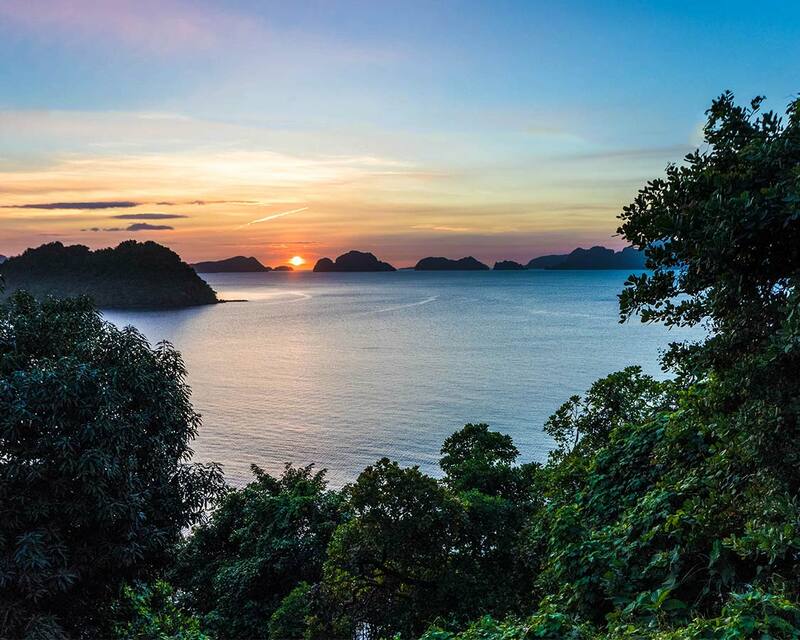 Kids will love the peaceful islands, abundant wildlife, and natural beauty of El Nido. Parents will love how open and inviting the town is, the great restaurants, and wonderful views. And families won’t be able to get enough of all the incredible things to do in El Nido Philippines! 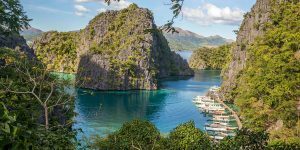 I know nothing about the Phillipines, the different islands and such- but this looks like a really great destination for those (like me) who love the outdoors! Two beautiful lagoons?!?!?! Love it! The food looks really yum as well. What a fab place to travel with kids! In fact hubby and I were just talking about our pre-kids trip to the Philippines and how we would love to take them back. We didn’t make it to El Nido though. Awesome – such a great thorough guide! We are planning to spend 3 weeks in the Philippines next February, but I keep going back and forth on it. I know the beaches and water are beautiful, but did you find it really overdeveloped? Great question Dawn! I wouldn’t say that I found any of the areas “overdeveloped”. Boracay is by far the most “touristy” location that we found. El Nido is crazy popular, and the flow of tourists definitely lets visitors know about its popularity. But El Nido still maintains a hip vibe that I actually really liked. You can also find some areas that are still relatively undiscovered by the crowds. 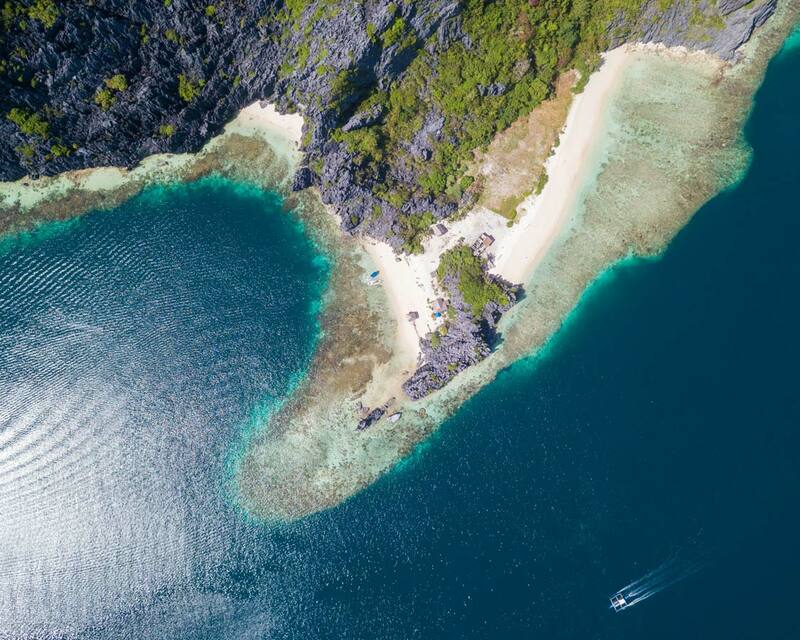 Coron for example is absolutely gorgeous and far less busy than El Nido. But one of the coolest places that we went in the Philippines was a town called Port Barton. It’s easily accessed by air (San Vincente Airport) and boat. It has amazing islands and wildlife to explore, but none of the crowds of the more popular areas. I highly recommend it, especially for families. Just gorgeous – your photos are beautiful! Great info about the life jackets. I don’t know that I’d even think to bring our own. The lack of life jackets was really surprising. Bringing our own was one of the best decisions we made. These photos are amazing. We haven’t been to the Philippines yet, maybe someday! Wonderful post with great photos. The Philippines is definitely on our list of dream destinations. Thank you for your very well-written review and tips! We were on the fence about whether to stay at Puerto Princessa or make the trek to El Nido with our 4 and 8 year old boys and you’ve convinced me that El Nido is worth it. Have fun! Puerto Princesa is beautiful. But you won’t regret the experiences in El Nido. Thanks for the info Kevin… we too have young children and although they can swim, am always concerned for their water safety i.e. life vest – great tip!. I’ll look into the tour companies you recommend. I absolutely agree. Safety is always important to us when we travel with kids. Have an amazing time in El Nido!